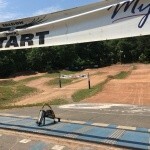 Join us this summer for the 31st Annual ShopRite Nutmeg State Games BMX Tournament hosted by Falcon BMX in Meriden! This is a great opportunity to compete in a statewide tournament in Central Connecticut. he Nutmeg State Games administration works closely with all Connecticut media outlets regarding any interesting stories about athletes and teams that will be participating in the "Games". If you have an interesting story to tell, we are all ears!